Last month, we reported how Greenwich Council says it can’t afford to pay for lighting around the skate park and gym in Charlton Park. The Friends of Charlton Park aren’t giving up, though – and are looking to get funding from elsewhere. If you’re a regular visitor to Charlton Park in the afternoon or evening, you can help them. If you pass the skate park and gym between 3pm and 9pm, keep an eye out for how many people are using them – and please fill in this form. The friends group hopes to be able to demonstrate what should be blindingly obvious – but needs underlining to people who can give money – which is that more people use the skate park and gym when there is light. Want to help the Friends of Charlton Park put on Parksfest? The group is also putting on a Parksfest festival around the skate park on Saturday 22 June – if you want to help raise money for it, there’s a Curryoke event on Saturday 16 March at 8pm at Cattleya on Charlton Church Lane. Tickets £25 are email elizabethrj001[at]gmail.com for details. And if you can spare some time to volunteer on the day of Parksfest itself, feel free to drop the group a line too. There’s an opportunity to meet your neighbours and other Charlton Park users on Sunday 27 January as the The Friends of Charlton Park are taking part in the RSPB’s Big Birdwatch. 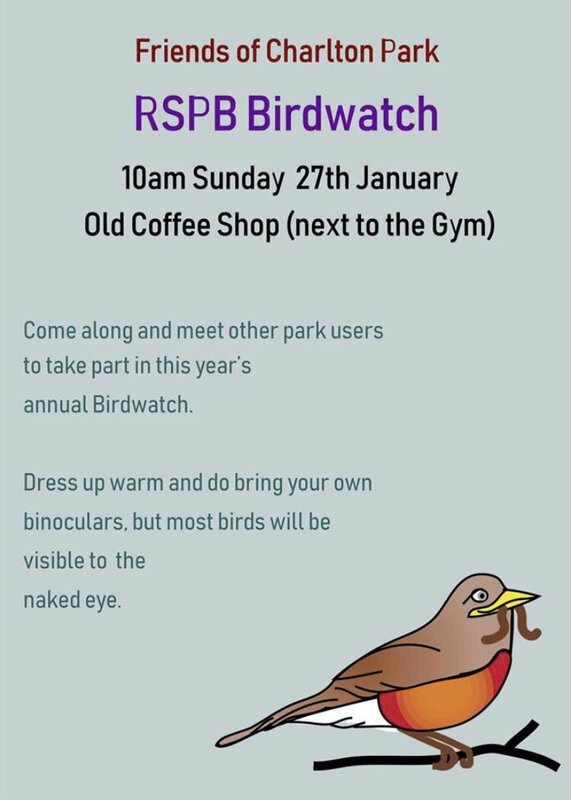 They’ll be meeting by the Old Cottage Cafe at 10am and birdwatching for an hour; they recommend you wear something warm and, if you have them, bring your own binoculars. The Big Garden Birdwatch has taken place nationally since 1979 and helps the RSPB to understand the changing populations of birds and other wildlife across the country. 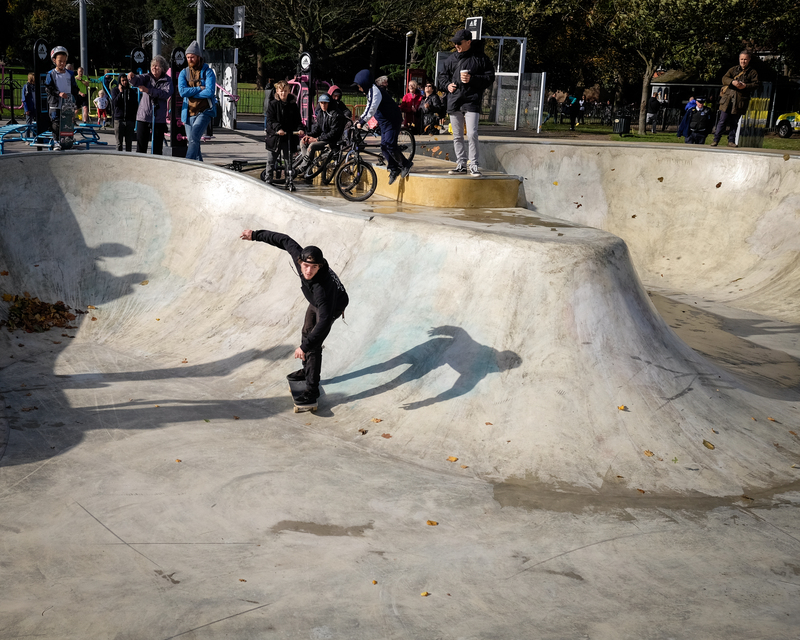 A petition asking Greenwich Council to install ‘low-level directed lighting’ around Charlton Park’s outdoor gym and skatepark has been launched by park users, including the Friends of Charlton Park, and Greenwich Skatepark Cooperative. The groups “want the space to be used more inclusively in the evenings, by all park users, be it dog walkers, joggers, gym users, and skatepark users“. The petition points out that there is floodlighting for the nearby football pitches, but the skate park won’t be usable in the evenings once the clocks go back. You can view and sign the petition here. June’s here, which means ParksFest season has started across Greenwich borough. Charlton Park will host the Great Get Together on 24 June, with a range of entertainment including World Cup-themed live music and workshops from Global Fusion Music and Arts, the Great Charlton Cake Off with Greenwich Clandestine Cake Club, and well-being activities organised by the Big Red Bus Club. For more information – including how to enter the Cake Off – see the Friends of Charlton Park’s website. The event runs from 11am to 2pm on Saturday 24 June (so you can squeeze a couple of hours in before the England v Panama match). Before the snow: Remember when you could see the grass in Charlton Park? The first AGM of the new inclusive Friends of Charlton Park will take place on Wednesday 7th March at Charlton House (Old Library) at 8pm. There’s a chance for everyone to join on the night. And we should be hearing from special guest Jackie Smith – Greenwich Council’s cabinet member for parks. If you love the park – or have an idea to make it better (Parkrun, anyone? ), go along – you’ll be made very welcome. The council have asked local people to form a new and inclusive Friends of Charlton Park group. A group that is open to all and includes runners, cricketers, footballers, coffee drinkers, horse riders, skateboarders, hikers, table tennis players, playground users, outboard gym frequenters, bird watchers and those that simply value Charlton Park. We’re keen to hear and views and ideas and keen to get as many people as possible along to our next open public meeting on 13th December at 8pm at Charlton House. You can find the Friends of Charlton Park on Twitter – @charltonfriends – and on Facebook.